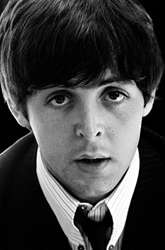 Beatle McCartney was going to change name . Beatles Radio: The Beatles, Solos, Covers, Birthdays, News The Fab 4 and More! The Beatles singer told a Q and A session with students at the Liverpool Institute of Performing Arts (Lipa) on Wednesday he had considered a stage name of Paul Ramon in an effort to appear more glamorous and joked he might return to it. The star, who also announced he would play a secret gig somewhere in Liverpool on Thursday, said while the band was on tour with singer Jonny Gentle in Scotland he began introducing himself to girls with the alternative name, while band mate George Harrison would introduce himself as Carl Harrison and John Lennon would call himself Long John Silver. He said: "We did think we had to be more glamorous."